A private investigator accused by National Party president Peter Goodfellow of conducting covert video surveillance has kept his licence, but has been reprimanded for non-compliant letterhead. Goodfellow had complained to the Private Security Licensing Authority that investigator Clinton Bowerman had used a hidden camera to film a discussion between himself and his ex-wife Libby Black. The couple are engaged in ongoing divorce proceedings, and Bowerman was working for Black as a private investigator and personal guard. 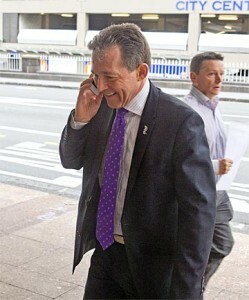 In a hearing on February 5 Goodfellow’s lawyer described the moment the National Party president discovered the filming. “He noticed something under a beanie hat. He lifted it up, and under it was a camera which had been on for an hour and seven minutes,” his lawyer said. Authority member Robert Gill said the filming had taken place at Black’s residence and an affidavit from her showed she had consented to the filming. Gill said Goodfellow was unable to show he had a legitimate expectation of privacy during the meeting with Black. “The situation would be quite different if the surveillance intruded into truly private or intimate situations such as bathroom or sexual activities,” Gill said in his ruling. Goodfellow also complained Bowerman did not wear a badge identifying himself as a personal guard, and failed to print an appropriate notice of his status as a private investigator on his letterhead. Gill ruled Bowerman did not need to wear a badge, and as the non-compliant letterhead had since been amended he would only impose a reprimand.